Author’s depiction of the FFA’s, CSA’s, and USSF’s connection to FIFA and their requirement as member associations to have national promotion and relegation based on FIFA statute Article 9: Principle of promotion and relegation. Logos courtesy of the respective organizations. Promotion and Relegation is a system, utilized around the world in multiple countries and sports, in which a pyramid is formed with several hierarchy levels called divisions (e.g. D1-D10+) where clubs compete each year in their respective levels under merit of play, the top clubs per level move up via promotion to the next higher tier and the worst clubs per level move down via relegation to the next lower tier based on their performance on the field. This is reflected by their total annual league / level / division points. Since 2008, the Fédération Internationale de Football Association (FIFA) has mandated promotion and relegation to be implemented by every 211 member association around the world, in full compliance with FIFA statutes in order to give every affiliated club – hundreds of thousands worldwide – the opportunity and choice to enter the official FIFA International Promotion and Relegation Pyramid. The best clubs from the top division of each open national promotion and relegation pyramid get promoted to the continental championships (the AFC Champions League, CAF Champions League, CONCACAF Champions League, CONMEBOL Copa Libertadores, OFC Champions League, and UEFA Champions League) and the best from those tournaments in turn get promoted to the intercontinental championship (the FIFA Club World Cup) for a chance to become FIFA club world champions. For the past 10 years, the Football Federation Australia (FFA), the Canadian Soccer Association (CSA), and the United States Soccer Federation (USSF) have all been violating FIFA statutes, regulations, and decisions. Specifically, (a) Regulations Governing the Application of the Statutes – Part IV. Sporting Integrity – Article 9. Principle of Promotion and Relegation; (b) Definitions – Part II. Membership – Article 19. Independence of member associations and their bodies; and (c) Definitions – Part II. Membership – Article 14. Member Association’s Obligations. By not having a national promotion and relegation system in place, the affiliated clubs in the three respective countries (Australia, Canada, and the USA) do not have a chance to enter and compete under merit of play in the only sanctioned pathway to the FIFA Club World Cup – the world club championship of football / soccer within FIFA. 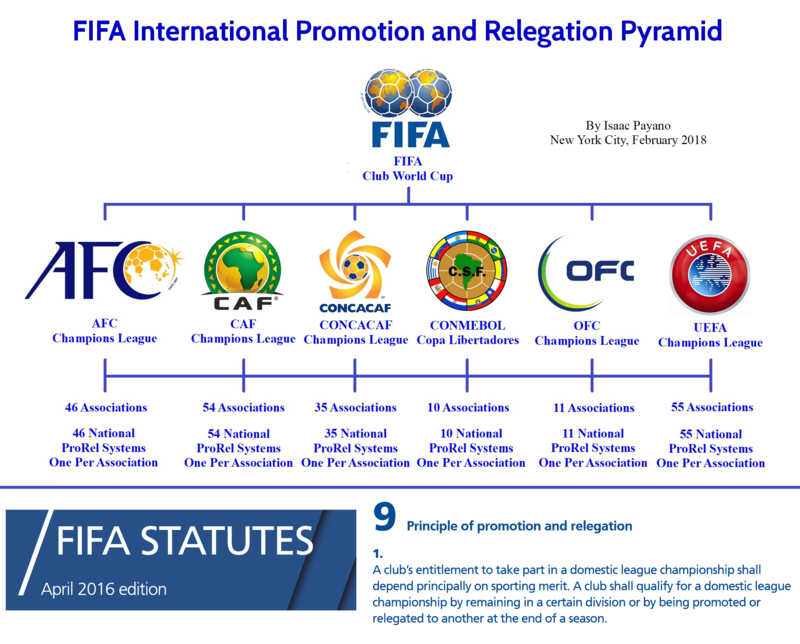 Author’s depiction of the FIFA International Promotion and Relegation Pyramid between FIFA, the six confederations, and the 211 member associations (FAs). Logos courtesy of the respective organizations. Author’s chart of the FIFA International Promotion and Relegation Pyramid between FIFA, the six confederations, and the 211 member associations (FAs). On March 12th, 2008, FIFA released a public memorandum titled FIFA to tackle areas of concern. In this online document, which specifically tackles areas of concern across the federation and all its members, FIFA addressed an important topic: “Protecting the promotion and relegation for clubs”. Author’s notes on FIFA’s memorandum: FIFA to tackle areas of concern – Protecting the promotion and relegation system for clubs. Image courtesy of FIFA. 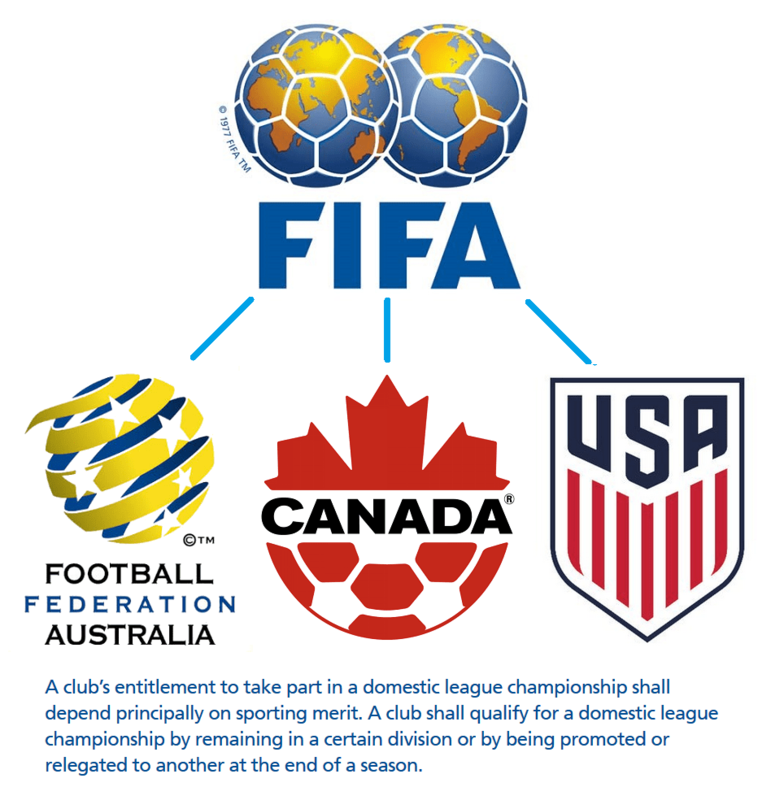 Problem A) There is no open national promotion and relegation system in the USA (USSF) and Australia (FFA) for affiliated clubs to participate in under merit of play, akin to the rest of the world, which connect to continental and intercontinental championships, which form part of the FIFA International Promotion and Relegation Pyramid. Problem B) Clubs have been artificially promoted to higher divisions by way of purchase or relocation (as shown in the Cause / Example). Image of FIFA statute: Regulations Governing the Application of the Statutes – Part IV. Sporting Integrity – Article 9. Principle of Promotion and Relegation. Courtesy of FIFA. With national league championships connecting to continental and intercontinental club championships, FIFA is absolutely clear in section 1 / par. 1 of this article, and reaffirms their intent from their 2008 memorandum regarding Problems A and B of the promotion and relegation issue, that the domestic / national league championship (also known as Division 1) in all member associations (including in Australia (the FFA), Canada (the CSA), and the USA (the USSF)), should be earned by merit of play through promotion and relegation, as that is a club’s entitlement. 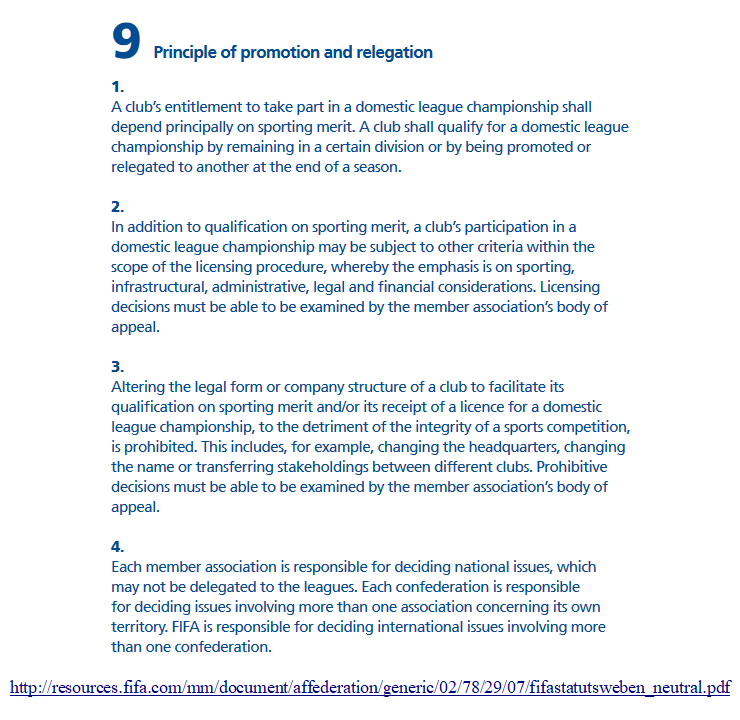 In other words, this means that all affiliated clubs to the member associations are entitled to a national promotion and relegation system connecting to the FIFA International Promotion and Relegation Pyramid, in which the member associations must make available as they are bound by FIFA laws / statutes (as shown ahead). Furthermore, clubs must qualify per level (e.g. between open D1-D10+) at the end of each season under merit of play through promotion and relegation (ProRel) only. Moreover, the article proceeds with section 2 / par. 2 where it distinctly says “In addition to”. It does not say “In lieu of” or “Aside / Apart from” or “Similarly / Congruently to” section 1 / par. 1 which is the foundation of the article that clearly emphasizes on “qualification on sporting merit.” Meaning that a club must first qualify only under sporting merit (as that is the foundation for promotion or entering a championship as mentioned in section 9.1, or as FIFA says: “the very essence of football”) – there is no other way – and then (e.g “In addition to”), following the previous (merit of play stipulation), be subject to and up to date with the licensing criteria mentioned above from the member FA (e.g. The FFA, CSA, or USSF). The FFA, CSA, USSF, or any other member association to FIFA, can not charge affiliated clubs multi-million dollar fees (e.g. $150 million dollars) to move up or down divisions (e.g. from D2 to D1) or allow such things to occur in sanctioned levels, within the FIFA International Promotion and Relegation Pyramid, as that would go against section 1 / par. 1. In other words, a club’s entitlement is to earn promotion under merit of play and then it must make sure to meet the reasonably basic requests from the FA (a proper / adequate stadium to play in, a proper front office staff, proper legal paperwork ready, and proper financial budget in place to sustain the club’s competition in the next level. Nothing more, nothing less). Section 3 / par. 3 of the article emphasizes on Problem B of the memorandum and the Example used in one country in which a D4 club in one city bought a D2 club in another city, then moved / relocated the D2 club near the D4 club’s city, then merged the two clubs while leaving the D4 club’s name as the official face, which then allowed for the D4 club to be artificially promoted to the D2 level. This matter along with the violation of section 1 / par. 1 has plagued the FFA, CSA, and USSF for the past 10 years – since the statute has been in effect, in which clubs are artificially promoted or given D1 recognition based on purchase. Without a national promotion and relegation pyramid in place directly connecting to the FIFA International ProRel Pyramid, the FFA has given exclusive D1 recognition to the A-League (with 10 teams), Canada to Major League Soccer (MLS) (with 3 Canadian teams) and most recently to the Canadian Premier League (CPL) (with 2 teams and more coming along), and the USSF to MLS (with 22 USA teams). – Bought CSA & USSF D1. Artificially promoted to D1 from a USSF closed D2 league. – Bought USSF D1. Artificially promoted to D1 from a USSF closed D2 league. – Bought USSF D1. Artificially promoted to D1 from a USSF closed D3 league. – Bought USSF D1. Artificially promoted to D1 from a USSF closed D2 league (without ever even playing in D2 yet). All 16 expansions and / or official league play commencements have taken place after the 2008 FIFA statute in which money (in the $AUD, $CAD, and $USD high millions) was paid to the respective leagues, while the FA’s were fully aware, to have teams become D1, which seriously violates section 1 / par. 1 and section 3 / par. 3 of Article 9. Division 1 (D1) is supposed to be exclusively for a national promotion and relegation system with merit of play for all affiliated clubs connecting to the FIFA International ProRel Pyramid. Some of these teams have even wrongly, violating FIFA statutes, taken part in the continental championships (CONCACAF Champions League and AFC Champions League). Effectively, D1 status within the FFA, CSA, and USSF which connects to the continental and intercontinental championships (including the FIFA Club World Cup) has been and continually is being illegally bought by the highest bidders (presently in MLS it equals to a prohibitive $150 million USD figure, which price is ever increasing). Section 3 / par. 3 reaffirms section 1 / par. 1 in its first sentence when it says: “Altering the legal form or company structure of a club to facilitate its qualification on sporting merit and / or its receipt of a license for a domestic league championship, to the detriment of the integrity of a sports competition, is prohibited.” It says that the integrity of a sports competition, in FIFA, is based on the qualification through sporting merit which section 1 / par. 1 is specific and firm on. In the final area of the article, section 4 / par. 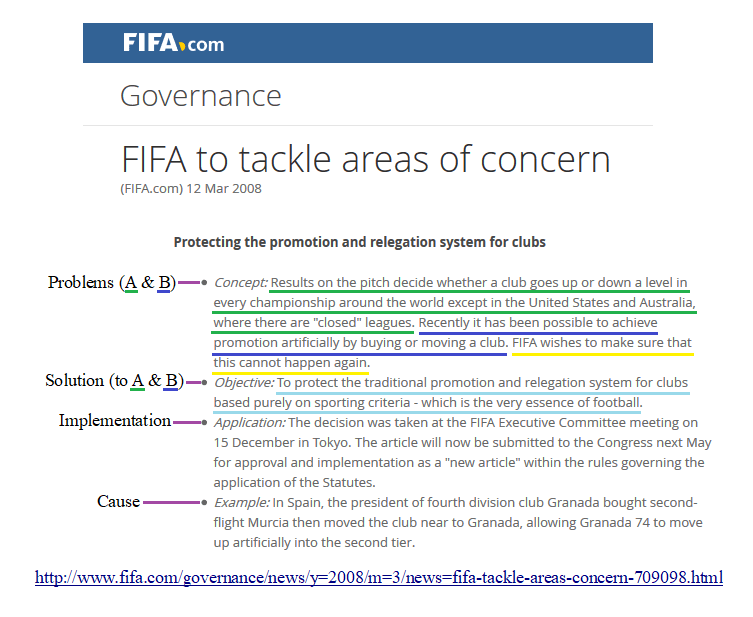 4, which is connected to and must be read as a whole with all other sections and the entire FIFA statues, states that “Each member association is responsible for deciding national issues, which may not be delegated to the leagues.” It expresses that the FFA, CSA, USSF and all member associations are entrusted by FIFA to be responsible, with the mandated FIFA statutes, for deciding the national issues including the obligated implementation of a national promotion and relegation system. It also states that the FFA, CSA, USSF, and all member associations have to decide the national issues that “may not be delegated to the leagues”. In other words, national promotion and relegation is not a league obligation or decision. The A-League, CPL, and MLS can not tell the FFA, CSA, and USSF, nor the AFC and CONCACAF, and neither to FIFA that national promotion and relegation can not exist in Australia, Canada, and the USA because their league business won’t allow it. On the contrary, it is not up to them – the leagues – to decide whether national promotion and relegation exists within the FAs themselves, as FIFA nor its statutes are not obligating ProRel within the specific leagues which can remain closed or independent. The decision is completely up to FIFA only which unequivocally compels the FFA, CSA, and USSF and all member associations to act and implement the national promotion and relegation system for all affiliated clubs to have the opportunity and choice to join for a chance at the FIFA interlinked national, continental, and intercontinental championships (including the FIFA Club World Cup). Not withstanding, participation from any specific leagues which can operate independently or in closed systems similar to the Indian Super League (ISL) (a closed system) which operates parallel to the I-League. The official D1 in the open national promotion and relegation system in India within the All India Football Federation (AIFF), which is a member association of FIFA, is currently the I-League. On May 29th, 2008, FIFA President at the time, Sepp Blatter, made the following statement in an interview with regard to the FIFA congressional decision of national promotion and relegation within all member associations: “The decision we made today does not affect the existing leagues but it will be a strong indication to these leagues to adapt to this principle”. Keep in mind that this is a statement made by one individual and not the entire congress who together voted on the matter and wrote the article. That said, however, Sepp Blatter specifically states, without conflation, that the “decision…does not affect the existing leagues”. He never stated that the decision does not affect the existing FAs / member associations, which it actually does, as they are bound by FIFA laws / statutes. Remember, the purpose of the statutes’ article (9) is based on Problem A of the “Protecting the promotion and relegation for clubs” section in the 2008 memorandum. In the portion that is named “FIFA to Tackle Areas of Concern,” the following language is used: “Results on the pitch decide whether a club goes up or down a level in every championship around the world except in the United States and Australia, where there are “closed” leagues”. That was and still today is a problem in the FFA, CSA, and USSF within FIFA’s eyes. FIFA followed by firmly saying “FIFA wishes to make sure that this cannot happen again”. FIFA’s solution: “To protect the traditional promotion and relegation system for clubs based purely on sporting criteria – which is the very essence of football.” This followed with the ratification of Article 9: “Principle of promotion and relegation” in the FIFA statutes. Blatter reaffirmed by his statement that the closed leagues themselves at the time, the A-league in Australia under the FFA and MLS in the USA under the USSF, will not be obligated to implement promotion and relegation though they should be inspired to, as he implies. However, that has nothing to do with the FAs / member associations themselves placing a national promotion and relegation system – which is the actual mandate in Article 9. Both the the A-league and MLS as two leagues are free to do what they want and remain in a parallel closed system while still associated to both the FFA and USSF, respectively, and in turn to FIFA – similar to the Indian Super League (ISL) in the AIFF. However, both the USSF and FFA must comply with FIFA and place D1 in a official open national promotion and relegation system, just like the AIFF in India also has the I-League. Meanwhile, the CSA recently gave D1 to the CPL, recognizing it as the top of the Canadian football / soccer pyramid which would connect to the FIFA International Promotion and Relegation Pyramid worldwide. According to Blatter’s statements at the time, the statute does also affect new leagues. Meaning that the CPL, as a D1 through the CSA, is furthermore bound to have promotion and relegation connecting to all clubs and levels in Canada. That said, it is not up to them, the CPL, to decide whether or not national promotion and relegation exists in the CSA, but up to FIFA who actually mandates it. If the CPL wishes to remain closed (even with a limited CPL 1 & CPL 2), similar to the A-League, MLS, or the ISL, then the CSA is also bound by Article 9 to place D1 in an open pyramid for all Canadian clubs to have the the opportunity and choice to participate in. Image of FIFA statutes: Definitions – Part II. Membership – Article 14. Member Association’s Obligations. Courtesy of FIFA. j) to comply fully with all other duties arising from these Statutes and other regulations. 2. Violation of the above-mentioned obligations by any member association may lead to sanctions provided for in these Statutes. 3.Violations of par. 1 (i) may also lead to sanctions, even if the third-party influence was not the fault of the member association concerned. Each member association is responsible towards FIFA for any and all acts of the members of their bodies caused by the gross negligence or wilful misconduct of such members. As Article 14 states, the FFA, CSA, USSF and all member associations to FIFA, as an obligation, must “comply fully with the Statutes, regulations, directives and decisions of FIFA bodies”. This means that the FFA, CSA, USSF and all member associations (not the leagues, but the FAs themselves) must implement national promotion and relegation with merit of play connecting to the FIFA International ProRel Pyramid as affirmed in Article 9: Principle of promotion and relegation. Furthermore, the FFA, CSA, USSF and all member associations must “take part in competitions organised by FIFA” this includes the FIFA International ProRel Pyramid which includes the FIFA Club World Cup. In doing so, the FFA, CSA, USSF and all member associations must effectively also comply with Article 9. These member associations must also “cause their own members to comply with the Statutes, regulations, directives and decisions of FIFA bodies”. Meaning that the FFA, CSA, USSF, and all member associations must make sure that the affiliated domestic regional associations and affiliated clubs must too follow the rules of Article 9 in order to participate in the FIFA International ProRel Pyramid and reach the FIFA Club World Cup. Furthermore, the FFA, CSA, USSF must also“ratify statutes that are in accordance with the requirements of the FIFA Standard Statutes”. 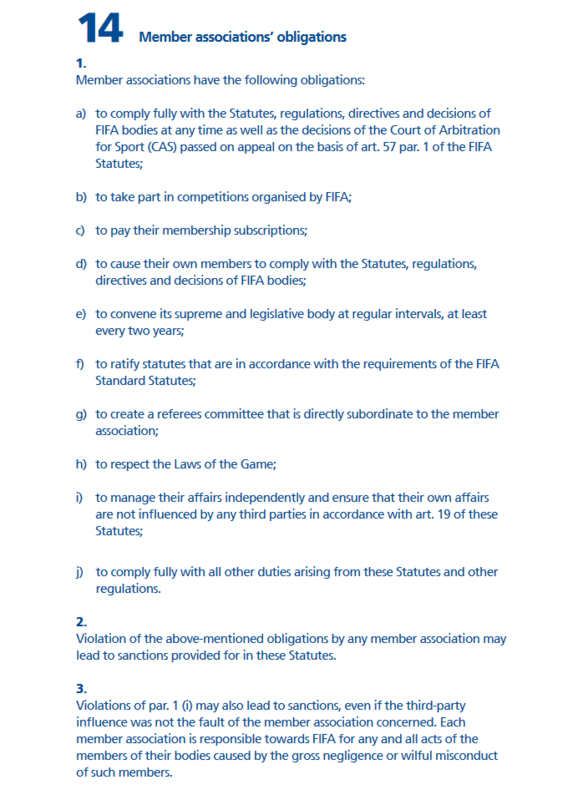 Meaning that in their own statutes and regulations, the member associations can not contradict Article 9 as that would be a violation of FIFA statutes. Moreover, the FFA, CSA, USSF, and all member associations must “manage their affairs independently and ensure that their own affairs are not influenced by any third parties in accordance with art. 19 of these Statutes.” In other words, neither the A-League, CPL, or MLS can tell the FFA, CSA, or USSF that open national promotion and relegation with D1 access to the FIFA International ProRel Pyramid can not exist within the FFA, CSA, or USSF as that is not a decision for the leagues to make (as also mentioned in Article 9 section 4 / par. 4). The FFA, CSA, and USSF, compelled by FIFA statutes, must implement national ProRel within their respective countries irregardless of any closed leagues. In addition, the FFA, CSA, USSF, and all member associations must “comply fully with all other duties arising from these Statutes and other regulations.” In other words, like Article 9 section 4 / par. 4 states that “Each member association is responsible for deciding national issues, which may not be delegated to the leagues”, the FFA, CSA, and USSF have a duty and responsibility to implement an open national promotion and relegation system for all affiliated clubs in their respective countries to have an opportunity and choice to join in order to compete for national, continental, and intercontinental championships, through the FIFA International ProRel Pyramid, which is recognized by FIFA as the legitimate pathway to the FIFA Club World Cup. Furthermore, the USSF specifically has a set of rules for arbitrary closed D1, D2, and D3 sanctioning called the USSF Professional League Standards. These “standards” violate US anti-trust laws, as I have argued in a document called How the North American Soccer League (NASL) can truly win against the United States Soccer Federation (USSF). In addition to violating US anti-trust laws, these arbitrary standards also completely contradict and violate Article 9, which emphasizes merit of play, as well as Article 14 as any statute or rule created by USSF must be in accordance with FIFA statutes. The USSF PLS standards state for D1 that “75 percent of the league’s teams must be in metropolitan areas with at least 1 million persons.” This criteria alone arbitrarily and discriminatorily prevents thousands of clubs in the US, all found within more than 320 metropolitan areas that have a population of less than 1 million persons which equal in total to about 96 million people in the US (about a third of the US population), from ever reaching D1. Furthermore, the USSF PLS standards also say for D1 that a club must have a “Principal owner with an individual networth of at least $40 million USD” and a “Combined owner net worth of at least seventy million US Dollars.” This criteria can only be satisfied by less than 0.02% of the US population, while it won’t be possibly met by 99.98%, which would mathematically and deceptively limit the amount of clubs that can ever reach D1 to a few dozen. 1. Each member association shall manage its affairs independently and without undue influence from third parties. c) having arbitrary standards that limit the quantity of clubs that can have D1 access. FIFA has 211 members. With only 3 countries out of the 211 not in compliance, that means that (98.57%=) 99% of the world has promotion and relegation. FIFA statutes Article 9 “Principle of promotion and relegation”, and Article 14 “Member Association’s Obligations” are designed for FIFA to have 100% compliance by all members. Well, the reality is that it was never up to the A-league to decide for national ProRel in the FFA. If the A-league didn’t want ProRel in their league or it’s just not (ever going to be) ready it is one thing, but the FFA should’ve never waited or continue to wait around for them to make a decision at the expense of the thousands of clubs in Australia that are affiliated to FFA. It was and still is the FFA’s job – duty and responsibility – to place D1 in an open pyramid while the A-league remains closed like the Indian Super League (ISL). Whenever the A-league is ready, they can eventually join the existing national open D1 pyramid. 2) The CSA’s excuse has been that since 1992 Canada hasn’t had a national pro soccer league. Yet, for over a decade, since 2002, the Voyageurs Cup has existed where three to five pro Canadian teams playing in US pro leagues have competed to win the CSA’s CONCACAF Champions League (CCL) berth and a chance to enter the FIFA Club World Cup. These selected three to five varying Canadian teams, for the past 16 years, have all been franchised based – paying expansion fees for territorial rights in the US pro leagues to obtain the USSF / CSA D1 or D2 arbitrary sanction without merit of play. Yet, the CCL berth could’ve been placed in a true Canadian Open Cup Championship where all Canadian clubs, thousands across the country, could’ve participated in. In fact, there have always been leagues and / or open cup tournaments in every Canadian province and territory, even since 1992, the champion of which could’ve entered a championship tournament round similar to the Canadian Challenge Trophy, which has existed since 1912, in order to gain the CCL berth. In many ways, the CSA was held back for almost two decades by the US pro leagues when the CSA should’ve already placed D1 – as it is their duty and responsibility – in an open pyramid. Today with the CPL potentially connecting to all clubs, the CSA has the chance to be in full compliance with FIFA. Yet, even without the CPL’s participation, the CSA must still be in compliance with all FIFA statutes including Article 9.
f) USSF or MLS does not need ProRel to be successful. i) FIFA will not obligate MLS to do ProRel. j) And the humdinger of them all: the USSF can’t place ProRel in MLS or (closed) US leagues because it goes against US anti-trust laws and FIFA will be in the US Supreme Court if they try. Notice that every misleading excuse given by USSF’s leading members (Mr. Sunil Gulati / USSF President and Mr. Don Garber / USSF BOD member; USSF Chair of the Nominating and Governance Committee of the USSF BOD; and USSF Pro Council leader), synchronized with MLS rhetoric, has always duplicitously involved the name MLS in their equation. 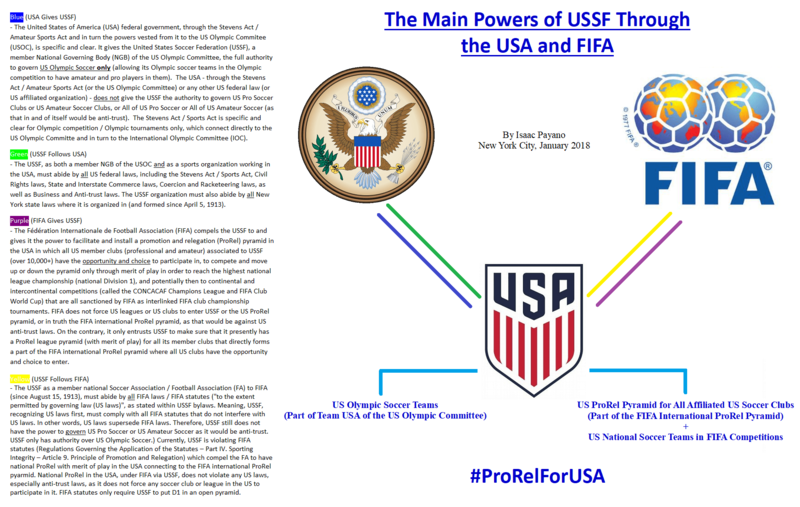 Well, the reality as shown above is that it is not up to MLS, or its need for participation in an open system, to decide whether or not there should be national promotion and relegation in USSF in connection to the FIFA International ProRel Pyramid. It is not up to USSF either to make a final decision. It is up to FIFA which actually mandates USSF to have national promotion and relegation even without MLS – which can remain closed like the Indian Super League (ISL). FIFA statutes do not mandate ProRel in leagues, like the A-league, CPL, or MLS. That is a falsehood and misleading machiavellian narrative. FIFA statutes do mandate national ProRel in the member associations like the FFA, CSA, and USSF, each of which must work independently from any third party influence (including leagues and marketing arms (e.g. the USSF+MLS+SUM relationship)) when making dutiful and responsible decisions, for all its affiliated members – including the thousands of clubs in them, that are in compliance with all FIFA statutes, regulations, and decisions. Furthermore, FIFA statutes, especially Article 9: “Principle of promotion and relegation”, do not in any shape or form violate US anti-trust laws as that too is a false argument by USSF, and should never be used again as a scare-tactic threat against FIFA. Again, FIFA and its statutes do not obligate ProRel in MLS or in any US league, which would be against US anti-trust laws for forcing a business to change its structure. FIFA mandates ProRel in USSF, the member association to FIFA which is bound by FIFA laws, and mandates the placement of FIFA national D1 in the USSF open system, which was never meant to be sold but earned under merit of play by affiliated US clubs in order to connect to the FIFA International ProRel Pyramid and the FIFA Club World Cup. Author’s depiction of the Main Powers of USSF through the USA and FIFA. Logos courtesy of the respective organizations. Why is the AIFF in India not out of compliance with FIFA? The AIFF is in compliance with FIFA because they have a national promotion and relegation system for all the thousands of clubs in India to join, and that system is directly connected to the AFC Champions League and in turn the FIFA Club World Cup under merit of play. Meanwhile, the ISL, a parallel high quality closed system, still has a berth to the AFC Cup which is the lower level continental championship and, through a win in that tournament, a fair opportunity to play in the AFC Champions League. Presently, the AAFC are requesting to have promotion and relegation in connection to the single-entity franchise-based A-League. The AAFC, as an association, is fighting the wrong fight. The AAFC should be fighting in the Court of Arbitration for Sport (CAS), which is a court that is fully acknowledged by FIFA in their statutes to handle special cases, stating and demonstrating that they already have national promotion and relegation with the majority of clubs in Australia through the NPL and that they should be the ones to have FIFA D1 recognition and the AFC Champions League berths. They should join the USA clubs – Miami FC and Stockade FC – in their CAS case vs USSF and make a joint argument versus both USSF and the FFA. Why is the FFA out of compliance with FIFA? The FFA is out of compliance with FIFA because a closed league, the A-League, with 10 teams are the ones receiving D1 recognition and the AFC Champions League berths, while thousands of Australian clubs are left out of the FIFA International ProRel Pyramid. This arrangement would give the NPL, which already has national promotion and relegation, the D1 recognition and the AFC Champions League berths, while the A-League, like the ISL, would still have a chance at a continental championship by having an AFC Cup berth. b) All other Canadian leagues. At this juncture, the CPL is still being developed as a franchised-base league and it will be ready for launch by 2019. The league has shown interest in eventually placing promotion and relegation in their league, but it isn’t clear when (5 years, 10 years, 20 years from now) and if it would be part of full national promotion and relegation system. Why is the CSA out of compliance with FIFA? The CSA is out of compliance with FIFA because D1 must be placed in an open national promotion and relegation system that is free from franchise fees and territorial rights as those designs violate Article 9: “Principle of promotion and relegation” which is completely merit based through promotion and relegation. The CSA must also give the CONCACAF Champions League berth(s) to the winner of the national ProRel system. This arrangement would still give the CPL a continental championship berth, while all clubs in Canada will have the right to participate in the CONCACAF Champions League through the merit based national promotion and relegation system. Presently, two US clubs – the Miami FC and Stockade FC – are fighting a major case against the USSF in the international Court of Arbitration for Sport (CAS) where they are demanding that FIFA obligates the USSF to implement national promotion and relegation. The claimants are not requesting promotion and relegation in MLS, as that would be against US anti-trust laws, but astutely and specifically in the USSF (even without MLS participation), which is within the scope of both US laws and FIFA laws. This way, the member association to FIFA in this matter – USSF – can put D1 and the CONCACAF Champions League berths in the open merit based system. For the past 25 years (since 1993), especially within the 10 years that Article 9 was ratified, USSF has been providing misleading excuses about not being able to impose ProRel in MLS, as mentioned above. That said, the excuses are invalid as FIFA is not mandating ProRel in MLS but ProRel in USSF even without MLS participation. It was never USSF’s right to give D1 to MLS which in turn has sold it for $150 million (USD), which seriously violates the statutes, and it was always USSF’s obligation to strip MLS of D1 and / or suspend MLS for doing so under FIFA statutes – if not, then USSF would face suspension or expulsion from FIFA for not taking proper action. Meanwhile, I have proposed for the North American Soccer League (NASL), the National Independent Soccer Association (NISA). the National Premier Soccer League (NPSL), the United Premier Soccer League (UPSL), and potentially the leagues in the United States Adult Soccer Association (USASA), which equal over 200 clubs in the first four and thousands in the combined five, to join forces. Together they can form an association similiar to the Association of Australian Football Clubs (AAFC). This new association can possibly be called the US Pro Soccer Association (USPSA) or similar. Together with the Miami FC and Stockade FC who are fighting their case in the CAS, both the USPSA and the AAFC as a unit can join them as an international coalition to impose ProRel in both the USSF and FFA. They can also get Canadian clubs to make the case against the CSA. Why is the USSF out of compliance with FIFA? That is because for the past 25 years (since 1993), and specifically the past 10 years since the implementation of Article 9, a closed league with 22 US franchises, with territorial rights and $150 million dollar (USD) expansion fees, are the ones receiving D1 recognition and the CONCACAF Champions League berths, while thousands of USA clubs are left out of the FIFA International ProRel Pyramid without national promotion and relegation under merit of play. D1 must be placed in an open national promotion and relegation system that is free from franchise fees and territorial rights as they violate Article 9: “Principle of promotion and relegation” which is completely merit based. The USSF must also give the CONCACAF Champions League berths to the winner of the national ProRel system. The USSF, under FIFA laws, must also eliminate several clauses from the USSF PLS, including the sections about metropolitan areas and ownership requirements. Potentially the US Pro Soccer Association with all connecting leagues and clubs. This arrangement would finally give the US an open national promotion and relegation system that is merit based for thousands of clubs to join, while still giving MLS (a 25 year franchise-based single-entity closed system since 1993) the opportunity to enter into a continental championship. Ideally we would have no closed leagues in India, Australia, Canada, and the USA, and all clubs would be playing in the respective country’s open pyramid. Yes, that would be ideal. 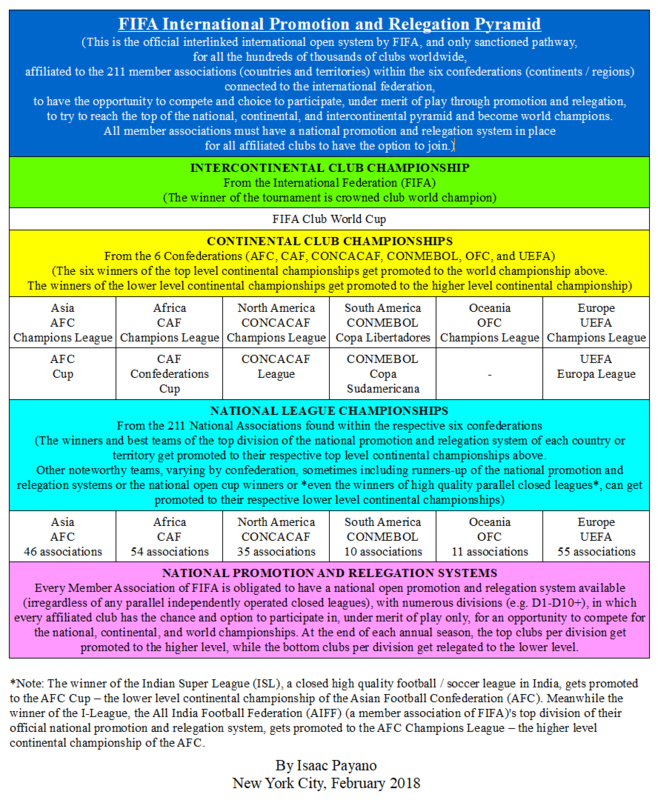 The I-League and ISL would merge, while the A-league, CPL, and MLS would all be free of franchise fees, territorial rights, and single-entity (where applicable) and be fully open under merit of play as the top levels of their respective country’s national promotion and relegation system. Yet, the reality is this: clubs and leagues around the world should be free to choose what they want to do, and no one nor FIFA can force leagues or clubs to join the national promotion and relegation pyramids or in turn the FIFA International ProRel Pyramid. However, FIFA can obligate the AIFF, FFA, CSA, and USSF and all member associations to put D1 in an open national promotion and relegation pyramid for all affiliated clubs to have the opportunity and choice to join. That, yes indeed, that they can do which is mandated in their statutes under Article 9: “Principle of promotion and relegation” and Article 14: “Member Association’s Obligations”, and does not violate any domestic anti-trust laws. This creates a true dynamic free market for every club to choose from. Like the AIFF, the FFA, CSA, and USSF must immediately become compliant with FIFA irregardless of any closed league – third party influence – and implement national promotion and relegation. All three member associations are seriously violating the FIFA statutes and are facing potential suspension and / or expulsion. The USSF is already facing a major CAS case, as well as several other cases for failing with the demands of leagues, clubs, and players. Hopefully, it will not come to that as in an ideal world everyone should be united. That said, USSF can no longer give excuses or be influenced by third parties. USSF is bound by the FIFA statutes and it must place national ProRel with D1 and CONCACAF Champions League access, even without MLS or any other closed league involvement. a) Is not up to the A-League, CPL, or MLS. b) Is not up to the FFA, CSA, or USSF. c) It is up to FIFA. FIFA mandates the FFA, CSA, and USSF, through the FIFA statutes Article 9: “Principle of promotion and relegation” and Article 14: “Member Association’s Obligations”, to implement open national promotion and relegation with merit of play in their respective countries even without the A-League’s, CPL’s, or MLS’ participation which can each remain closed like the ISL parallel to the I-League which is open. Will national ProRel happen in the FFA (Australia), CSA (Canada), and USSF (United States)? It’s not a matter of if or when. It’s a matter of it must, because it is mandated. There are no more excuses. Time is up and it is time to be in compliance with FIFA. Editor’s Note: This article was edited post-publication to correct spelling errors and grammar. No conceptual changes were made. Pingback : Midfield Press » Breaking the Rules: How the USSF Presidential Election is in Violation of FIFA Mandates That Prohibit Third Party Influence.